Frerichs Campaign Blaming The Truth Team For Their Problems?!? 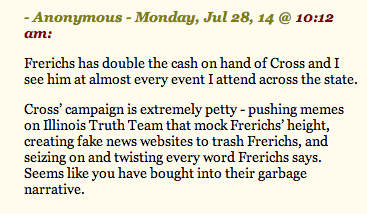 Looks like one of the Mike Frerichs for Treasurer campaign staffer is venting after what must have been a tough morning at campaign headquarters. And...guess who they're blaming? Us! To be perfectly fair, we've only talked about his height a few times. We *have* however gassed up on how he held his own "Meet Mike Frerichs" sign a bunch.